Fries. 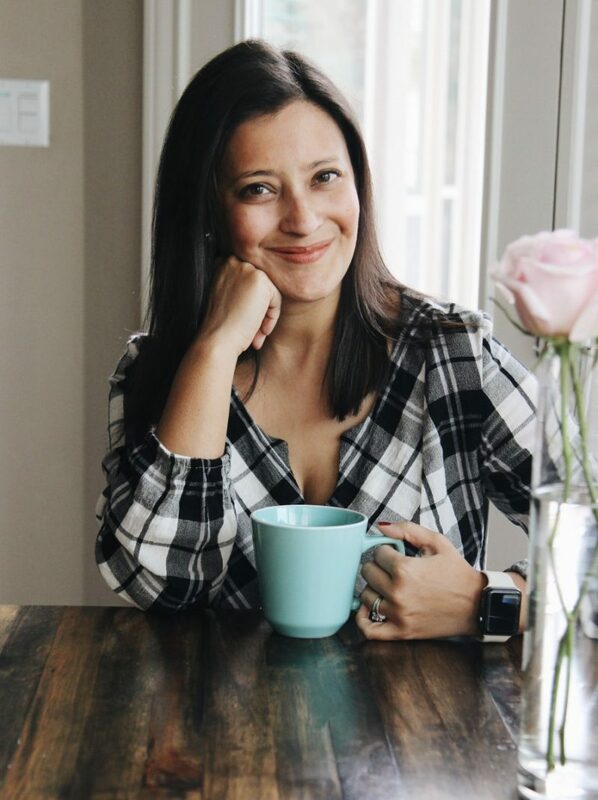 It’s a special love language for some. 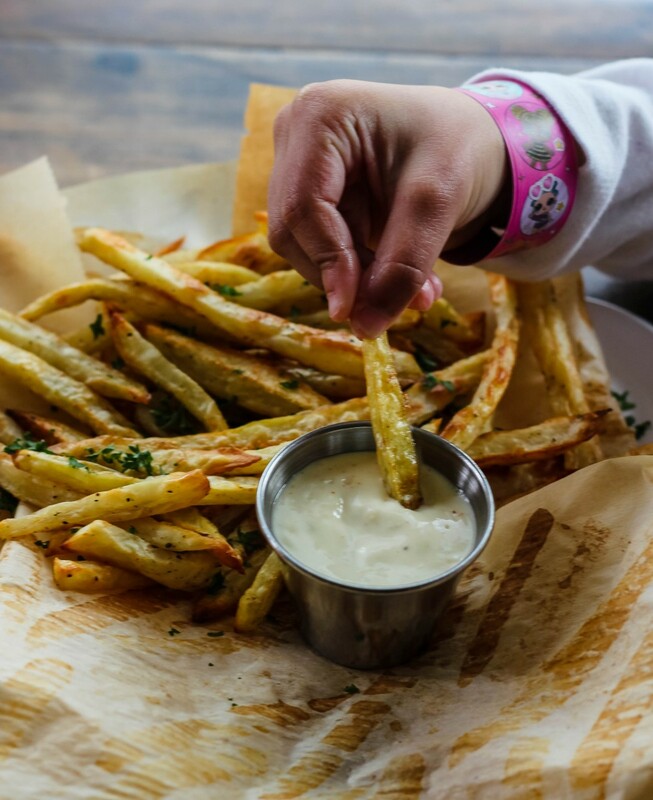 According to Ms. Kim on Gilmore Girls, they are the devil’s starchy fingers, but oh man do I love fries. I’m a Gilmore Girls GEEK. Also, if you’re a crazy GG fan, tell me ASAP!! I love anyone who is obsessed with the show and we need to be besties! HA. Now back to fries, before I start rambling on about that show. 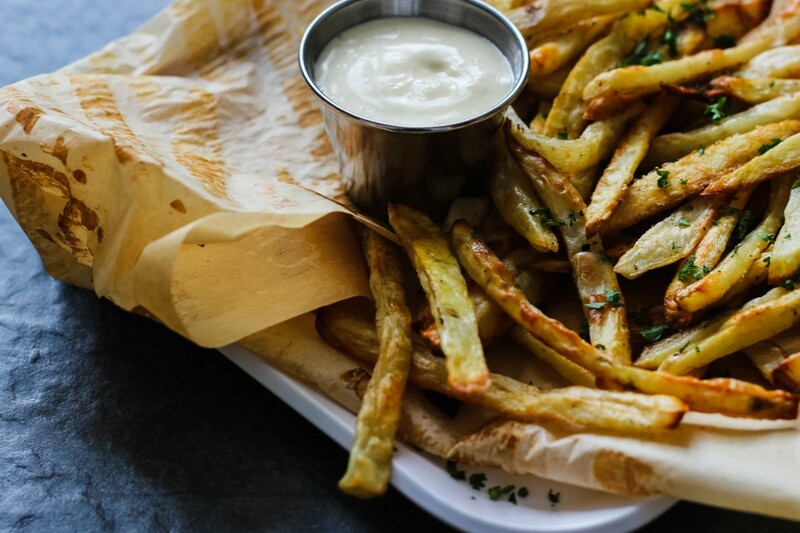 You can order fries literally from some of the fanciest restaurant while they are cooked in things like duck fat and served with special sauces, or just plain ol’ fast food places. 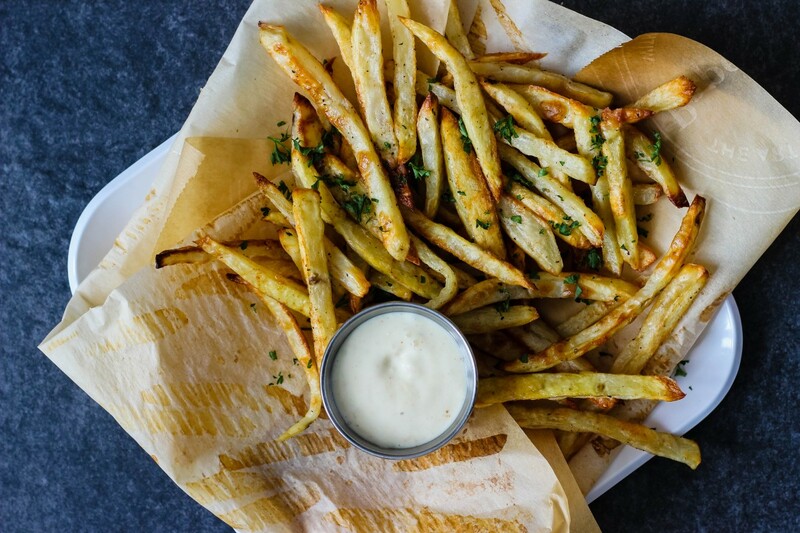 It’s one of the yummiest ways you can probably eat a potato, and I’ve yet to meet a single person who isn’t into fries. The disadvantage of eating them out is that they are normally fried, and in an oil that probably isn’t too fantastic for ya. Baking them at home and creating that same crispy outer layer, while soft on the inside has taken some time to figure out, but I think I’ve finally figured out the magic recipe!! 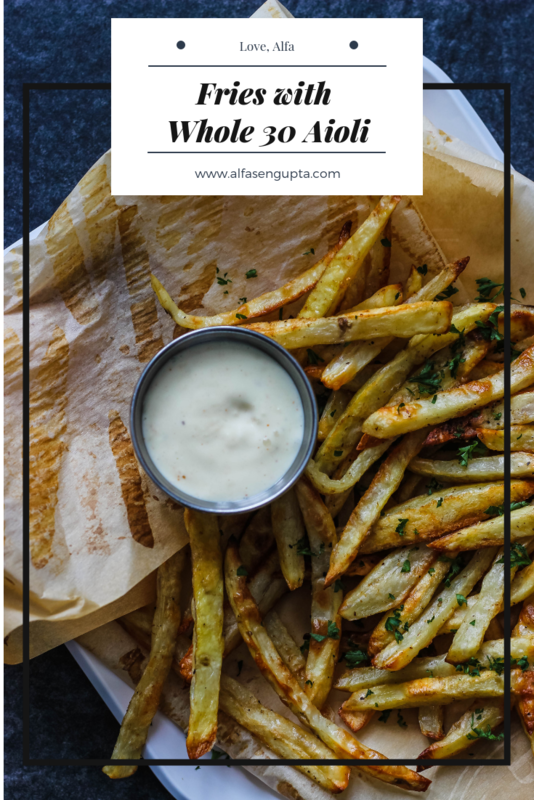 Serve them up with some of my whole 30 aioli, and you can easily have burger and fries type of dinner in your house! Preheat oven to 400. Line a baking sheet with parchment paper. Make sure to use parchment paper and not foil. You will not get that texture of the crispiness! Slice those potatoes lengthwise into 1/4 slices. And then cut into long strips to resemble fries. Put in a bowl and toss with avocado oil, sea salt, fresh ground black pepper. Set aside for at least 15 minutes, and you’ll notice there will be some water that will collect at the bottom of the bowl, which is what you want! 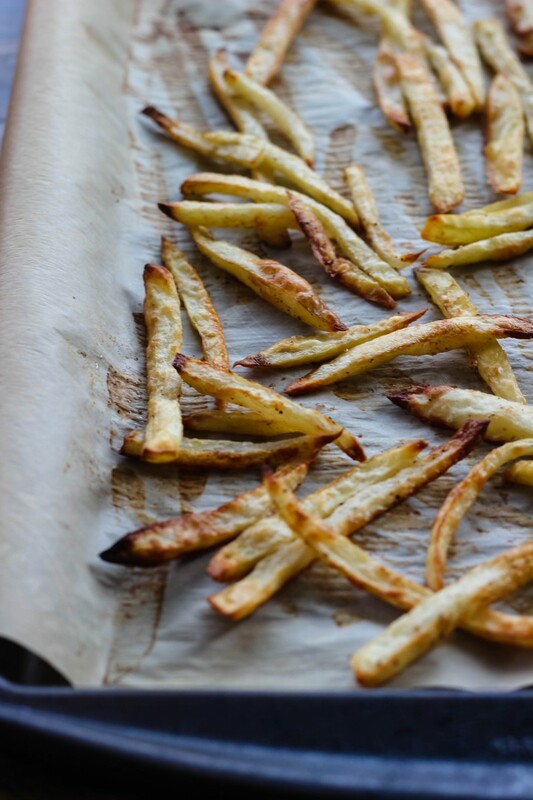 Once the oven is preheated, arrange the fries on your parchment paper and make sure not to get any of the water that was at the bottom of the bowl. 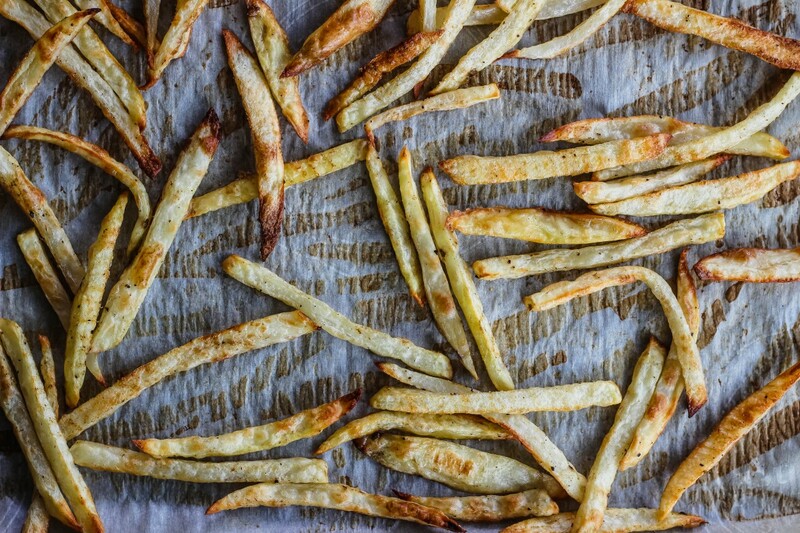 You want just the marinated fries on the sheet. Try to lay them out so they aren’t touching as well! Put them in the oven for 20 minutes. While they roast, I would work on getting the aioli made! Put the mayo in a bowl, and add the garlic and paprika. Stir in the lemon juice and EVOO. Give it a good stir and taste it. Depending on your taste buds, add salt and pepper! A pinch of each is usually enough for us! 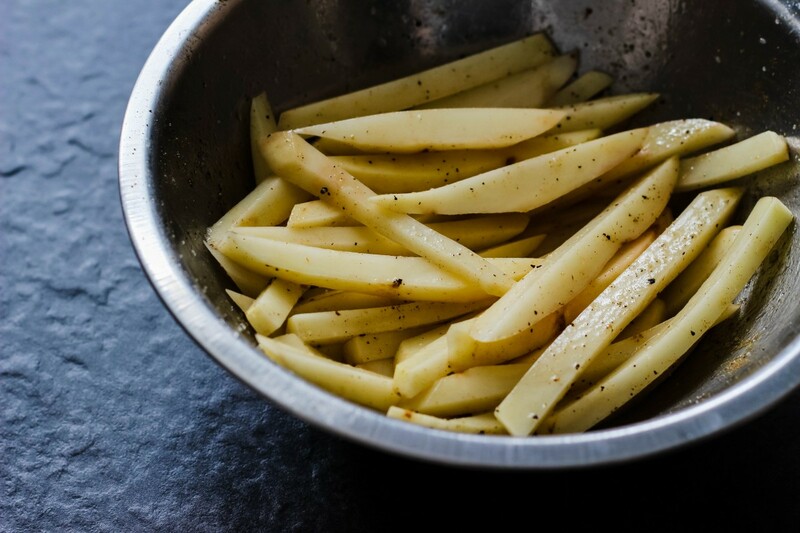 Once the fries are done cooking for 20 minutes, flip them and cook for another 10 minutes and then you’re golden, as are the fries! I use the parchment paper that they were cooked on as a liner, and plate them like that! Sprinkle the parsley on top and serve with the aioli! These go like hot cakes as soon as I make them! The kids ask for them all the time, and they even like the aioli which they lovingly call “olive sauce”. Part of me doesn’t want to correct them. 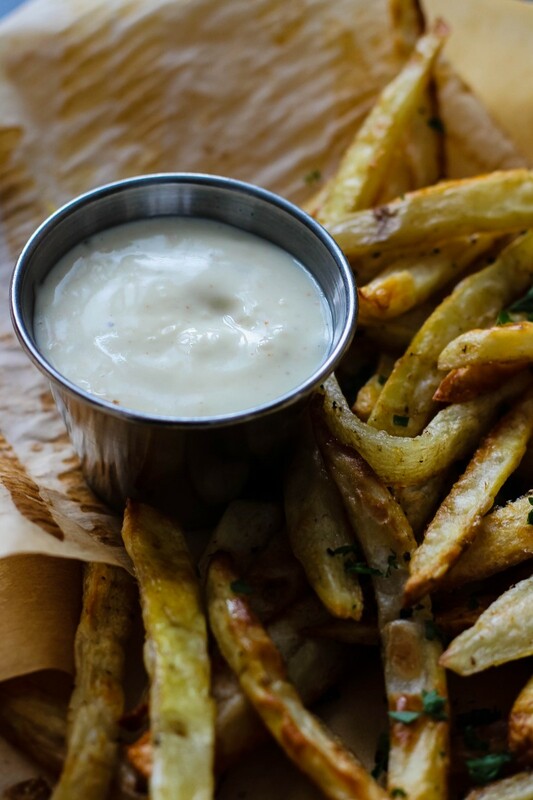 If you do nothing else, make the aioli. It’s good on SO MANY THINGS. Five Vegetable Side Dishes for Busy Weeknights!